While YouTube has emerged as a new channel to market products or services, there is a key marketing element that's just like any other form of advertising - capturing attention. In order to get the most out of your uploaded videos, you have to write effective titles, compelling descriptions and feature attractive thumbnail images. By doing so, you produce the best chance of a click-through. Each of these elements is editable in the YouTube control panel for each video you upload. 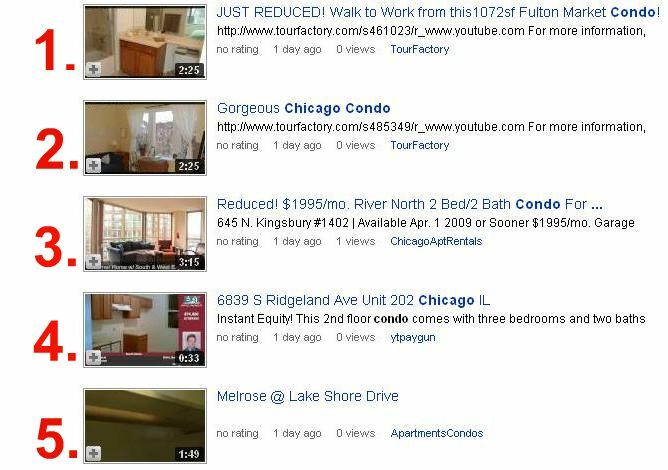 Below is a sample (image at bottom) of five results from a YouTube search for "Chicago condos," filtered by most recent uploads. Each offers lessons on effective (or ineffective) YouTube marketing. "JUST REDUCED" in the title tells the visitor immediately that the price has recently dropped and this might be a good deal. Also highlighted is "Walk to Work," and the address - very pertinent information for downtown city living. The description is lacking, with only a URL of the video. The thumbnail, while it could be better, does show that the bathroom features new fixtures and countertops. "Gorgeous Chicago Condo" conveys one message - that this is an attractive unit worth viewing. Unfortunately, the description is the same as the previous video and offers no further insight. The image could be better. As it stands, all you can really see is that an apparent bedroom looks small. It doesn't scream "gorgeous." The title for this one is excellent. You immediately know the price has been reduced, the neighborhood (River North) and the accommodations (two bed/two bath.) The description gets specific, with the address, availability and that a garage parking spot is included. The image conveys that it's bright and big. Should a shopper be interested in a two-bedroom condo in this neighborhood, there's a good chance this video is watched. Perhaps not coincidentally, it's the only one with a view, as of this writing. This title only tells us one thing - the location. The description helps a bit, with the promise of instant equity (a selling point), and we know it's a second floor unit with three bedrooms and two baths. The image isn't terrible, but one thing stands out. There's no oven. That's telling the buyer immediately that there's likely an added expense, and what else might be missing? There's not much to like in this listing. The title tells us an approximate location, but that's all. There is no description (the number of bedrooms, baths, etc.) and the image is just awful. It could be a hanging bar in a closet, it could be a rail on a staircase. Either way, it's not enticing me to click. It's important to remember that YouTube has millions of videos from which to choose. So, you must do everything in your power to make sure your video stands out and earns traffic. By optimizing titles, descriptions and thumbnails, you're setting up an essential front line to capture views. This becomes even more important when you're using annotations, advertising and other forms of marketing within videos.